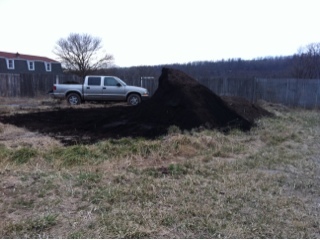 Every spring we take delivery on compost. We use compost made from leaves: called leaf grow or leaf mold depending on where it is sourced. We also make tons of compost ourselves, but have found it impossible to have too much of such a good thing. We always hope that the tractor trailer will be able to drive across the property and deposit right at the hoophouse. We have yet to locate a driver willing to do that, so the load goes into the front yard, in our parking lot. Then a tractor trailer load of compost needs to be transported to where we need it. It's about half done. And it's only March. So that's good. Today the materials for more raised beds in the hoophouse arrive. Built out, filled in and planted by days end. Next weeks planting should go into the ground outside the hoophouse. We will cover with floating row covers until nighttime temperatures are a bit warmer. Peas are in. Onion sets will go in next. Lettuce, spinach, rainbow Swiss chard, carrots, beets and radishes today. Time to check the asparagus bed to see if the shoots are popping. After all the snow melts.